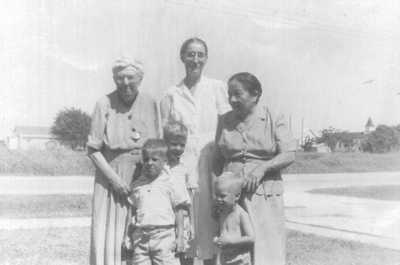 On a lazy Sunday afternoon in 1955 I had just finished dinner (lunch everywhere but the South) at the Blessing Hotel and had nothing to do because my friend, Benny Glen, and his family had gone off to see relatives in a nearby town. 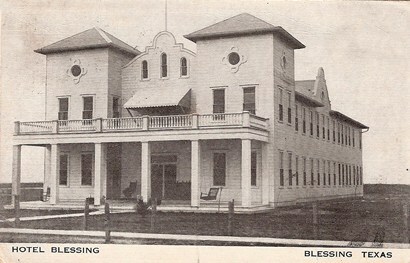 Sitting on the veranda of the Hotel Blessing, I rocked madly in one of the white rockers tipping it backwards just to the point where it might fall over and then forward until my nose almost touched the porch boards. I was at loose ends on this day with lots of extra energy and wondering what I might do to entertain myself. I had just stopped the rocking and was pulling off socks and shoes when I noticed two older ladies I had not seen before. Reluctantly, I joined them, sitting on a porch rail facing both. No ten year old ever wanted to talk to two old ladies unless one was his grandmother and then only for a moment. �What�s your name?� the old lady asked. �Ahhhh�nice to meetcha,� I replied, now ready to make my escape. �First off, my name is Marie Borden, but most folks know me as Mrs. A.P. Borden. My husband, A.P. died in �35 and he was the nephew of Shanghai Pierce. Have you ever heard of Shanghai Pierce?� she asked. �Miss O�Neal, before I tell this story, would you please freshen my iced tea?� she asked, �And get Pete here a Coca Cola and put that on my bill.� Dutifully, Miss O�Neal rose from her rocker and headed off to the kitchen to fetch the refreshments. A nod of affirmation from me. �So that�s why they call Ft.Worth �Cowtown� �I think we are moving there soon,� I asked and offered. �What was special,� I asked, now swinging my legs back and forth with clear eagerness to get moving and away from Mrs. Borden. �Did you ever hear of a Brahma bull?� she asked. �That�s right, and do you know how they got here�to the United States�to Texas?� she probed. �That�s really neat,� I replied. �Wow,� I replied, �Thanks for the quarter and I will see you next week. And off I ran shoes and socks left lonely on the other side of the front porch. I�d be retracing my steps to find them for Sunday night church. �Okay,� I said, �I�ll see you on the front porch after dinner tomorrow,� and hurried off to the table where my parents and Sister were sitting. �Oh, nuthin� she just wants to give me something tomorrow so I told her I would see her after dinner,� I said. Nodding that I understood, I choked down the spinach with minimal amounts of gagging and thought to myself the poor Chinese could have all the spinach as far as I cared. Swallowing the dish of peach cobbler in three bites I was out the door for the Fondons � barefooted. �Sometimes I do,� I answered, �But my feet are tough. Feel.� I hold up a dirty right foot for her to examine the calluses from a summer of no shoes. I was about to be bored to death, I just knew. Somehow, a kid just knows when an adult is about to start talking about something that will not be very interesting. I was not sure then what a disciple really was except for church and the references to Peter as a disciple. But I know today that Mrs. Borden was clearly a disciple for William H. Danforth as she began to explain the message contained in this small book. �Mr. Danforth believed you have to lead a balanced life to succeed � four-square he called it,� she recited. �You must be physically strong, mentally creative, socially magnetic and spiritually strong to be a success and you have to start doing all that now not waiting until you are grown up,� she went on, explaining each principle in greater depth and with examples from the book. Finally she closed the book and handed it to me saying, �Pete, this is now your book �and,� I dare you to be great,� she concluded and smiled, again giving my knee a squeeze and patting my hand with her old wrinkled one. This was more high minded thinking than I could manage in a single sitting and I was getting itchy to go. Recognizing my energy level rising and my attention level dropping, Mrs. Borden said, �Pete, look at me.� And, I did. �I am just an ugly old lady who is stuck in a wheelchair but do you know what I do?� she asked. �I go all over the world and work with lepers,� she said. �With the money I made from selling our ranch lands and donations I get from Mr. Danforth I have started more than 200 churches and have helped leper colonies in Africa and Hawaii. Why, did you know that the whole island of Molokai was once nothing but a leper colony?� she asked. I shake my head no indicating that I didn�t know any of this at the same time sneaking looks at her hands to see if she had leprosy from hanging around so many of them. 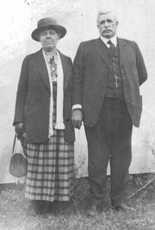 Between Mrs. Borden and Bible stories about lepers I was now pretty certain that leprosy was a very bad thing. And, I didn�t much like talking about it. Two worries high on my list were getting leprosy and car wrecks. Mrs. A.P. 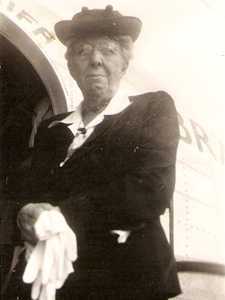 Borden boarding a plane in Houston for a trip to St Louis, MO. �Thank you, Ms. Borden. I�ll read the book and thanks for the quarter; I promise to save it!,� I say and head back into the hotel to show the book to my mother. In our hotel room I opened the red book and read what Mrs. Borden had written on the first blank page in big bold script, �To Mr. Pete, I Dare You to be Great. May your life be a grand success, Mrs. A.P. Borden.� I tucked the small book into my suitcase where it would be safe. I was sure I would read the book very soon. And I tucked the quarter into a dirty sock, vowing to myself to save it forever.